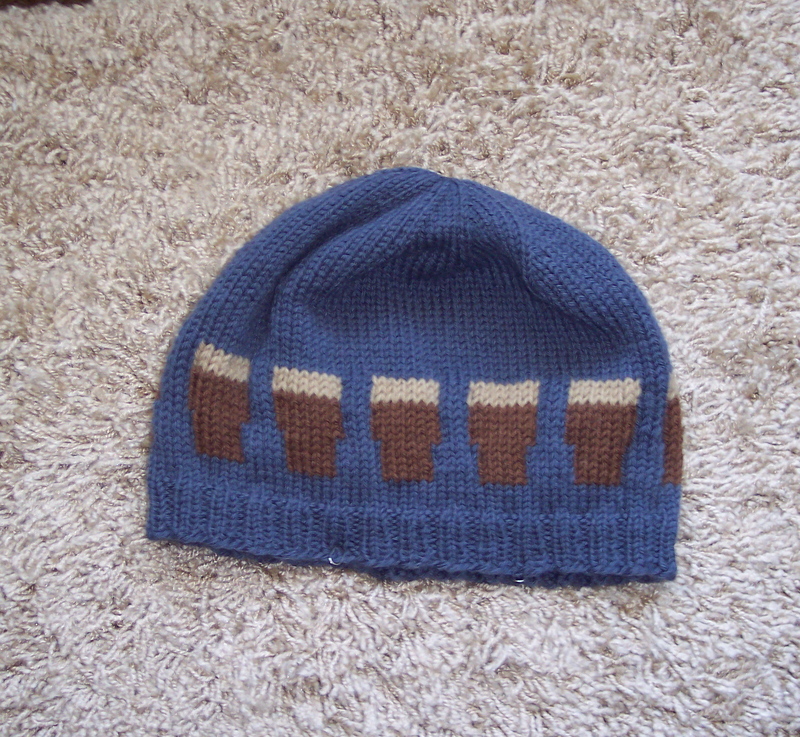 While surfing Ravelry for hat patterns, I found a hat that was decorated with big, dirty pints of porter. The pattern was offered for sale, with the proceeds going to the USO, but I’m too cheap to pay for a pattern I can reverse engineer with ease. So I made my own chart for the big, dirty pints, designed a hat, and knitted it with yarn from my stash. I call it the “Slainte! Hat” because slainte! is Irish for Cheers! I would have preferred to use a darker brown, since Guinness is nearly black, but I had to make do with what I had, which was some Knit Picks Wool of the Andes in Chestnut that has been in my stash for years. For the lucious, creamy head, Snickerdoodle, also K-P WotA from my stash, is the perfect color. The main color of the hat is a medium bluish-gray WotA called Mist. When I decided to knit this hat, I had a recipient in mind. The DH and I go out to eat once a week with two other couples. I’m not the only Guinness quaffer in the group, and one of the members of the group who is also a Guinness drinker was about to have major surgery. The hat was knitted especially for him. Stranded colorwork patterns are fun to play with. The entire look of a pattern can be changed simply by reversing the colors. Normally the darker colors recede and the lighter colors come to the fore. 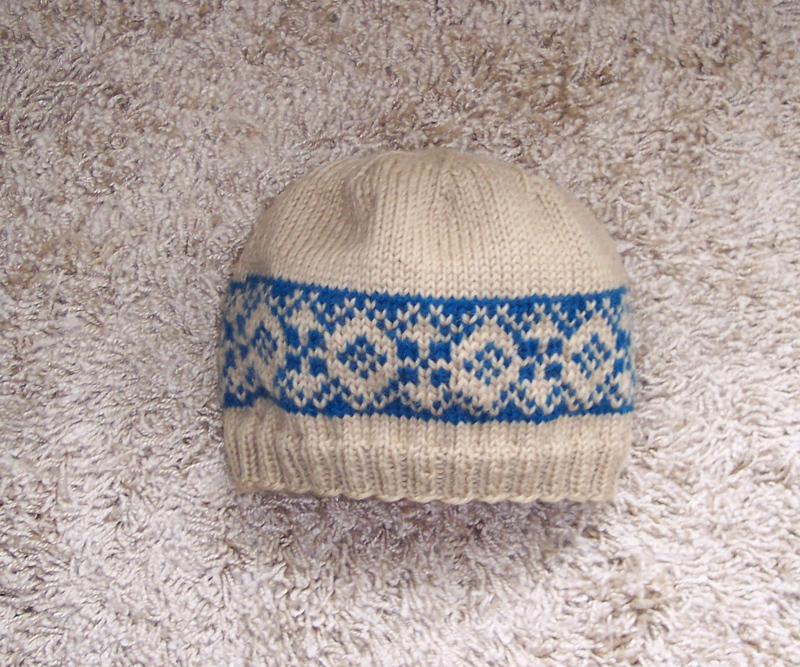 I mention on my old blog how much I enjoy knitting the hats designed by Amy E. Anderson. I bought two of her hat patterns a couple of years ago and have knitted them numerous times, often adding my own touches, but keeping the colorwork patterns intact. Recently, after finding an old cache of K-P WotA in my stash, I thought that two of the colors, Snickerdoodle and Blueberry, would make a nice color combination in a hat. What better way to show of this color combination that knitting one of Amy’s patterns! 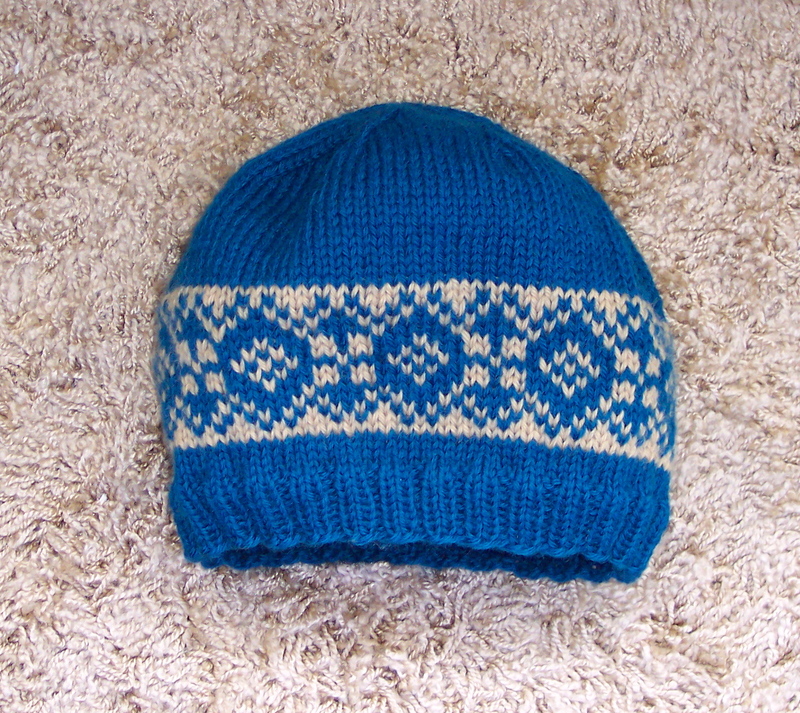 I chose the Alberta Clipper pattern, but I didn’t want to make an earflap hat, so I used my standard hat pattern and incorporated the Alberta Clipper colorwork chart. I used Blueberry as the main color and Snickerdoodle as the contrasting color. The resulting hat is really gorgeous, if I do say so myself. 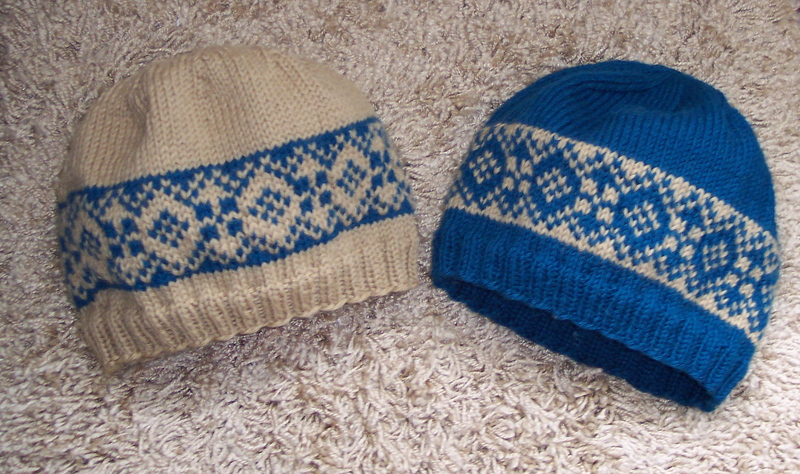 In fact, I liked the Blueberry Clipper Hat so much that I decided to knit another one, only this time I reversed the colors, using Snickerdoodle as the main color and Blueberry as the contrasting color. Once again, the results were quite spectacular. Here are the two hats side by side. It always amazes me how much different a colorwork pattern can look when you simply reverse the light and dark colors. Keeping to the theme of stranded colorwork, I have one more hat to share in this post. 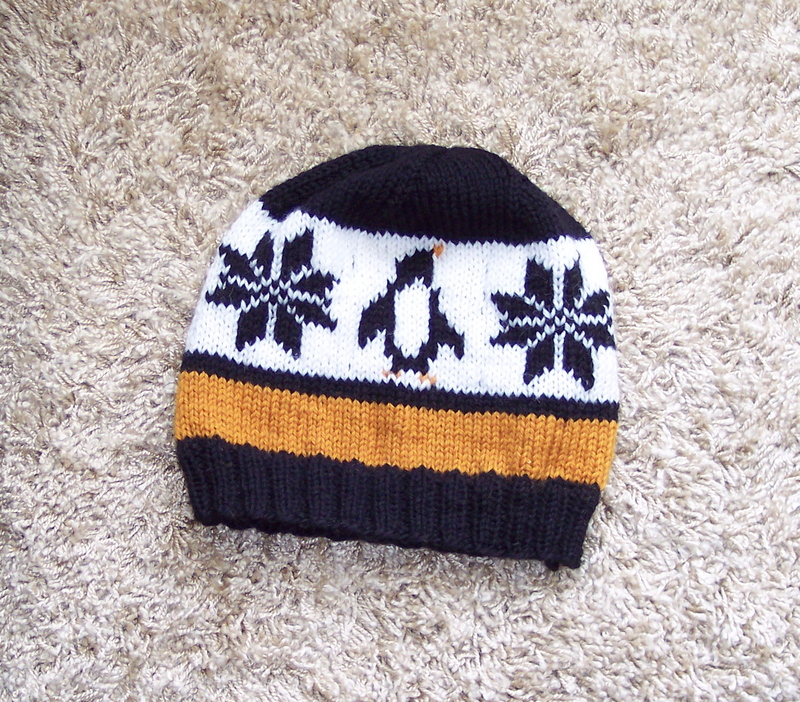 This one is called Penguins and Snowflakes, and it is a pattern that I found on Ravelry. I’m not in love with this hat or the pattern. The snowflakes are lovely and the penguins are cute, but there are places where the yarn floats are very long. I wove them in as I knitted, but I made the mistake of weaving them in at the same stitch each time and ended up with unsightly ridges, and the black yarn shows through the white. Well, that’s four hats down and 10 or 12 to go. Maybe I should declare a hat moratorium until I get caught up. Nah! This entry was posted in Hats, Knitting. Bookmark the permalink.